Range in Hawai‘i: All Hawaiian Islands, now rare on O‘ahu. Diet: A herbivore that eats only diatoms and filamentous algae. Predators: Birds such as ‘auku‘u (black-crowned night-herons). When it comes through the estuary many species of native fish will eat ‘o‘opu ‘alamo‘o such as āholehole, ulua (Caranx spp. ), moi (Polydactylus sexfilis) and kākü (Sphyraena barracuda). ‘O‘opu akupa will also eat this species during its upstream migration. Introduced fish are a problem because they have brought in new parasites and all prey on this and other native ‘o‘opu species. Fact: ‘O‘opu nopili are good waterfall climbers, though not quite as good as ‘o‘opu ‘alamo‘o, and were a favored food fish for early Hawaiians. 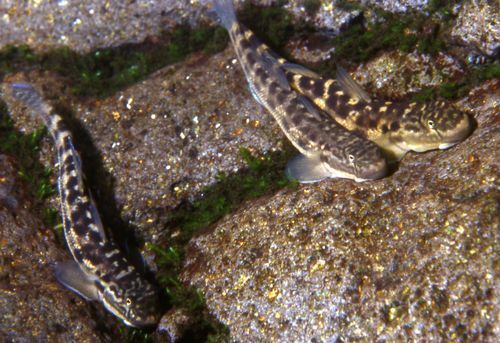 ‘O‘opu nopili will maintain and defend a favorite territory in the stream called a feeding patch, which is easily observed as a clean area on the rock scraped clean of algae by this fish. In breeding season the males are perhaps one of the most beautiful of all Hawaiian fish having a changeable, brilliant blue color and long blue and red dorsal fin undulating with the mood of the fish.